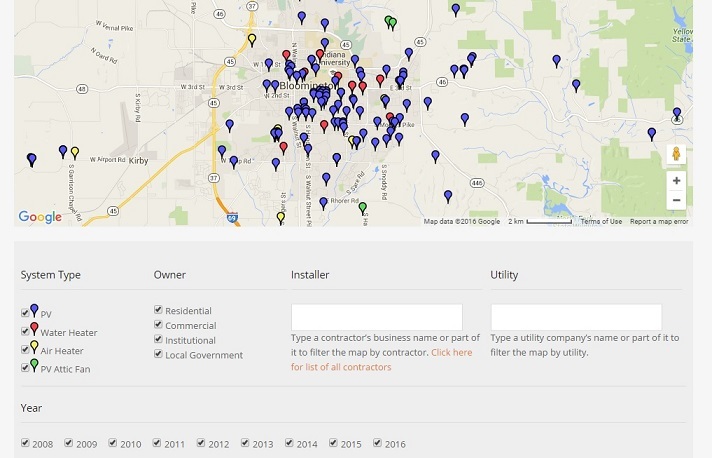 The SIREN solar map since its inception in July 2013 has been one of the most appreciated feature on our website. This past winter SIREN volunteers Arvind Gopu and Soichi Hayashi worked on a complete redesign of the Solar Map functionality. The map interface allows interactive filtering of content by system type, installer, year, or owner type, and responds elegantly to different screen sizes. A revamped tabular listing is also available including the ability to download a CSV file of the data for easy analysis. New entries can be submitted via a simple Google Forms based web form. We are excited to unveil this ‘Solar Map 2.0’ and hope it lives up to the legacy of the original version created by SIREN founder Terry Usrey!